XtraTime VIDEO: Mohammedan Sporting win 65th Bordoloi Trophy! Home / Indian Football / Second Division League / XtraTime VIDEO: Mohammedan Sporting win 65th Bordoloi Trophy! 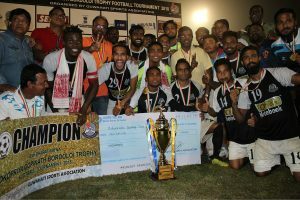 Mohammedan Sporting Club clinched the title in the 65th Bordoloi Trophy after beating Oil India FC 3-1 in the final played at the Nehru Stadium in Guwahati on Thursday, November 8. Watch the XtraTime report from Guwahati! Previous FC Goa score spectacular 3-2 comeback win over Delhi Dynamos! Next 2018 Batch of AFC Referee Academy commences Introductory Module I!